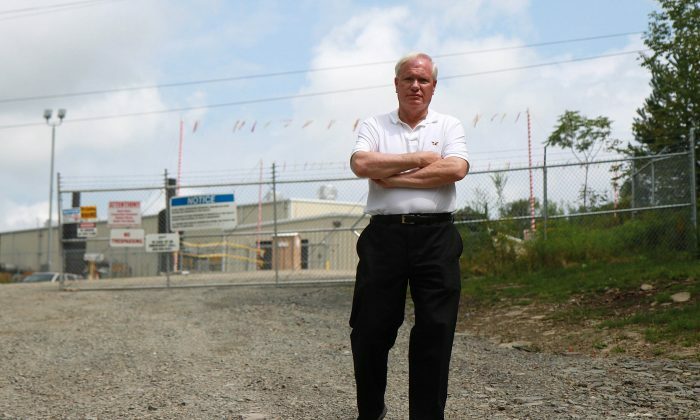 MONTROSE, Pa.—Since his days as a New York City Council Member in 2008, New York State Sen. Tony Avella has fought vigorously to ban hydraulic fracturing in New York State. He has called it the most serious environmental issue the state has faced in 100 years. The Marcellus Shale, which overlaps with New York City’s watershed, holds vast natural gas reserves. A moratorium on the practice is in its 5th year. Avella will continue his fight in the Senate at least another year, after dropping his run for Queens Borough President on Aug. 14. The Senator, who refused to take campaign contributions from lobbyists or developers, could not keep up with opponents Peter Vallone, Jr., and Melinda Katz, who had over three times more money in their coffers and a wealth of endorsements. While the move surprised many in political circles, Avella said his constituents, unions, as well as good government groups were leery of him leaving his post in the Senate. As Queens Borough President, the job would mostly deal with land use development, and his powers would largely be limited to issues in the borough. Politically, he would have next to no powers at the state or local level to keep fracking out of the New York City watershed. Staying in the Senate will give him more time to pursue the nine Senate bills related to fracking with his name on it, ranging from a ban, to worker safety, to waste disposal. With his schedule freed up from campaign events, Avella was finally able to drive to Susquehanna County, Pa., the home of Montrose and Dimock Township where fracking has already occurred, and where some residents are saying the practice has harmed their water supply. It was a trip he had tried to make for most of this year, but his schedule never allowed it. “There is nothing like seeing it firsthand and getting someone to tell you how bad it is,” Avella said on Aug. 28. Despite having never stepped foot on a fracking field, the senator has been one of the most outspoken critics of fracking in the legislature. Despite having never seen fracking firsthand, Avella is well versed on the issue, having hosted two Senate Democratic Conference Public Forums in 2012 in which scientists, medical professionals, and economic experts testified. In addition, he has met with industry representatives to discuss his concerns. The trip to Pa. allowed him to put a face on the data he had been studying for years. The tour was hosted by Craig Stevens, a 6th generation land owner in Silver Lake Township, and Vera Scroggins, a local activist. Both are vigorous opponents of fracking, but with good reason. Each of them watched their home turn from a quiet sleepy town with picturesque landscapes, to the epicenter of an industrial movement in which some residents’ water supply is ruined and the town is divided. Avella does not want to see the same fate befall upstate New York. New York State is currently reviewing regulations designed to keep water contamination from fracking from hitting the water supply, but Avella has been a staunch proponent of an all-out ban. On the tour Avella met Ray Kemble, a Dimock Township resident whose tap water supply was ruined weeks after a well was fracked near his home. Kemble, who has no gas drilling on his property and therefore receives no monetary benefit from fracking, has water brought in from outside to drink and shower with. Kemble turned on the water from his well, pouring it into a jug. The water appeared clear, however a strong odor and bubbles could be seen. The EPA ran tests on Kemble’s water and ruled it safe for consumption, however Kemble says the tests were done two years ago. Kemble also says he offered the EPA agents a glass of his water they had ruled safe, but the EPA agents refused to drink it. For Avella, the trip provided context for a story he has long been familiar with: what a compressor station sounds like; how close the drilling pads are to the homes; how much truck traffic the two-lane roads experience; what it is like to be followed by oil and gas company security teams; what exasperated residents who have lost their water supply feel like. The trip didn’t change his mind—it only made his convictions stronger.